Larp House Presents: So You Think You Can Dance? During the 2002 Israeli military invasion of Ramallah, people were arrested at random and put placed in a transitional prison camp while they decide whether to release the prisoners or transfer them to a permanent prison. By coincidence a group of former classmates from Birzeit University are arrested in the middle of the night. They are held at this prison camp with hands tied and eyes covered. In So You Think You Can Dance? the players will take the roles of characters that each represent different political views on how to end the occupation, as well as different visions for the Palestinian State. 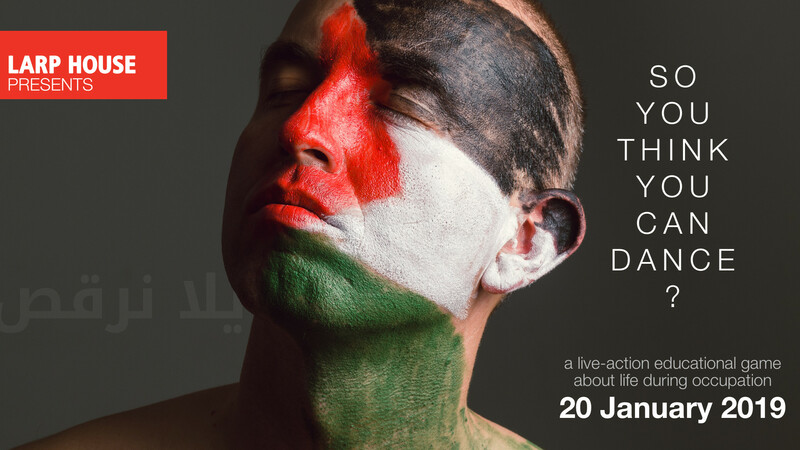 During the scenario the characters will revisit their political arguments from 1993 (year of the first Oslo Accords), and explore how these arguments and political views have developed by 2002. So You Think You Can Dance? is an educational live-action game for non-Palestinians about the internal Palestinian political situation, for 5 to 10 players. So You Think You Can Dance? will take place at SpringBOX, located at 262 University Ave W in Saint Paul, Minnesota. Parking on site. METRO Green Line and bus lines stop nearby. If you are interested in participating, fill out our So You Think You Can Dance? registration form before 11:59 pm on Saturday, January 12th. We’ll let you know if you are in the larp by Monday January 14th. SpringBOX is a space for community events and programming, operated by Springboard for the Arts. We are requesting a pay-what-you-want goodwill donation ($5 suggested) to support the work of SpringBOX in appreciation for the use of their space. No one will be turned away if they are unable to make a donation.